Colin Paine is a Detective Chief Superintendent in Thames Valley Police. He is currently working on the Police Spending Review with the NPCC. Here he reflects on his diagnosis of Myalgic Encephalopathy (ME)/Chronic Fatigue Syndrome (CFS). Police work feels inherently fast paced. It is in the nature of our work that we are often ruled by the tyranny of the immediate. The demands are endless and our resources are finite. It is no surprise that many of us, particularly those in leadership, end up working long hours at a frantic pace. This is a necessity of our environment, but perhaps the time has come to ask whether working this way is sustainable, healthy or always adds as much value as we might think. I had pause to consider this when I fell ill with ME/CFS. Many in the police service will relate to the sense of feeling ‘tired all the time’, particularly with shift work, high workloads and on call. However, most will not have ME/CFS – which takes this sense of fatigue to an entirely different level. Many of those with ME/CFS are housebound and a significant proportion are unable to work altogether. I experienced this extreme weariness in the first months of illness. I struggled to walk short distances, slept 14 hours a day and then eventually work became impossible. Like an old smartphone, I needed to be recharged several times a day just to keep the most basic functions going. The recovery rate from ME/CFS is dishearteningly low, with just 5% making a full recovery . There is no cure available, and the treatments available have mixed results. To begin with I believed that by sheer force of will and determination I would be able to fight and defeat this dark malevolent fatigue; how wrong I was! I read the research extensively and tried numerous treatments without success. As time passed I began to realise that the metaphor of a fight was just wrong – to suggest it is a battle suggests that those who remain long-term housebound are just not fighting hard enough – which is manifestly unfair. Instead of seeing it as a fight I began to realise that this is a journey; a journey I had not chosen to go on, and indeed a journey I would rather not travel – but one that would provide me with opportunities to learn and develop along the way. After months off work and dozens of visits to the doctor I was eventually diagnosed with ME/CFS. With the kind support of my Assistant Chief Constable I returned to work, initially on reduced hours. I lacked the energy to get into work – so I worked lying down at home. It felt like I was travelling in a canal boat watching my colleagues hurtle along a busy motorway. I was asked to tackle some of the perennial thorny and insoluble issues that had troubled our Force, such as ethical decision making in non-recent child abuse cases and more recently to work with the Home Office on the Police Spending Review. I couldn’t work for eight continuous hours so I worked for an hour or so and then rested before getting back to it again. 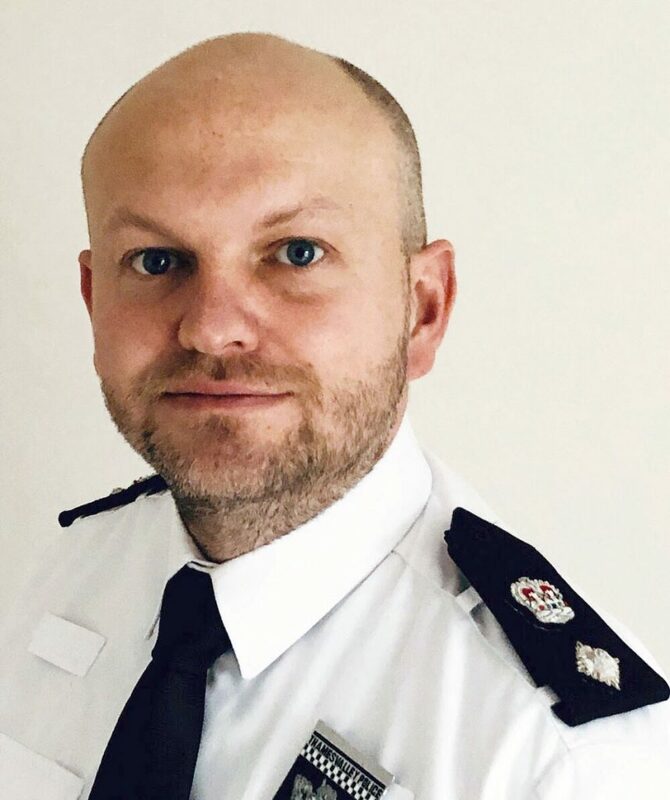 What I learned was that although I could not manage the normal duties of a Chief Superintendent I was nevertheless able to add real value – but in a completely different way. Normally my diary would be packed and my phone ringing constantly. Instead my condition enabled me to undertake deep work; thinking about some issues at a level that had not previously been done. With colleagues and academics we identified new ways of thinking about traditional problems; new thinking that could save millions and potentially be adopted nationally. In the normal fray of policing, this would never have been possible. The modern working environment, aided by technology, has blurred the boundaries between work and home life. This blurring depletes us all; taking calls at home, checking emails in the evenings and being contactable when on leave is not healthy. However, my experience of illness is that technology has been an enabler. Being able to work remotely on a laptop and undertake meetings through conference calls has preserved energy that would otherwise have been wasted on commuting. Research shows that those who work remotely are frequently more productive than those office based; this is surely no surprise, as the lack of distractions enhances focus. The Service needs to focus on the benefits of remote working for both productivity and for the wellbeing of our people. My health has improved significantly over the last 18 months. I am now able to walk significant distances and work full hours; albeit with a number of rest breaks throughout the day. The marginal gains approach, made famous by the British Cycling Team, has been essential in making progress. I have re-examined each element of my life and sought to make small, but meaningful improvements in each area. I have adopted a pacing approach; pacing is striking the balance between activity and rest, doing something for a while then deliberately resting, whether I feel fatigued or not. My wife got us a little dog early on in my illness, which was been a blessing as he needs short walks each day. I have learned the value of good sleep hygiene as Matthew Walker outlines in his excellent book “Why We Sleep”. I have learned to place the utmost value on dietary nutrition and have recognised how convenient processed food further depletes energy reserves. These are all lessons I wish I had learned long before falling ill – lessons the Service is only now waking up to. Much has been written in recent years on the value of time management, but this has taught me that it is energy management that is paramount. Energy is the most precious resource we have; it is the petrol in the engine – without it we are going nowhere. We all have a finite amount of energy available (although I have less than most), so learning to optimise it is critical. With ME/CFS my energy levels fluctuate and are often unpredictable. However, I have learned that there are predictable peaks and troughs throughout the day and week. I do the most challenging work during my times of peak energy and administrative work during troughs. Learning which activities (and people) energise and deplete us is essential to maintaining energy levels. Being intentional in planning activities to prioritise and those to bin is critical to our health and our productivity. I have also learned that breaks are not a deviation from performance, but they are a critical part of performance; those people who take regular breaks perform better than those who don’t, as Daniel Pink explains in his book “When”. Being intentional in planning activities to prioritise and those to bin is critical to our health and our productivity. It can be difficult for those in leadership positions to say “no”; most leaders have got where they are by seeking to be positive and obliging, but saying “no” is critical to our success at work. The culture of policing is ‘can do’, but it is only by saying “no” to lower priority activities that we can ensure delivery on the most critical work. A positive and supportive “no” is always more productive than a weak and resentful “yes”. I am increasingly minded that we should focus our limited energies on those areas in which we can add unique value. The National Institute of Health and Care Excellence (NICE) estimates the incidence of ME/CFS to be between 0.2-0.4% of the population, which would put the numbers in the UK at up to 250,000. ME/CFS occurs more frequently in women than men (ratio of 2 to 1) and the peak age for onset is between 20 and 40. There is no data on the incidence of ME/CFS within the police service. However, based on the prevalence within the general population, potentially between 400 and 800 people within the police service suffer with ME/CFS – the size of a small Force. The physical health challenges posed by ME/CFS come with associated psychological challenges. I felt acutely guilty, embarrassed and anxious after falling ill; which ironically further depleted my reserves. Learning to accept these feelings and manage the ceaseless and brutal voice of the ‘inner critic’ has been as big a challenge as managing the physical symptoms. I have learned to just make friends with the constant low level sense of guilt for having fallen ill, and an unrelenting anxiety that if my health deteriorates I might not be able to work. When I first fell ill my daughter said, “Dad, you are always here – but you are never here”. Learning to meditate (thanks to the Headspace app) and spot the cognitive distortions associated with anxiety (grateful to David Burn’s excellent book “Feeling Good”) has been transformational. Taking the long view and seeing my current health as just a stage in my career has been helpful. I am tremendously grateful for the handful of great colleagues who have stood by me. Ultimately I’ve had to learn the paradox of simultaneously developing a Zen acceptance of my limitations, and concurrently keeping the determination to keep moving forward in whatever small ways I can. I’ve been fortunate in having the best of line managers throughout. Even if they have not always understood the condition, they have always listened and cared. Line management is often a lottery – on this occasion it has been a lottery I have won. Leadership is not required in the good times; it is when things get difficult that leadership is critical. Without the kindness and support of my chief officers I would not have made it this far. It has caused me to reflect on my own leadership journey and realised that I haven’t always been as compassionate towards others’ health challenges as I now wish I had. This experience of poor health has transformed my outlook in ways that I could never have expected. It doesn’t matter if you don’t understand the health challenges others are going through – whether physical or mental – what matters is that you listen, empathise and care.